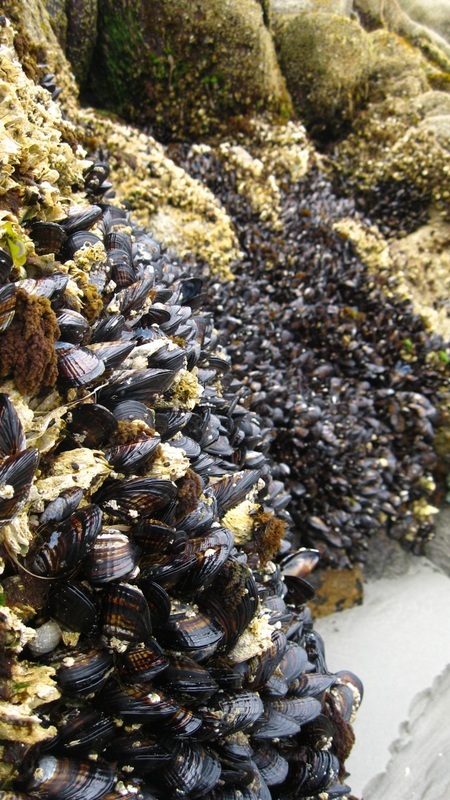 California mussels in rocky intertidal areas on Calvert Island. Photos by Arden Matheison (top right), Joel White (bottom right), and Julia Fisher. The California mussels can grow up to 25 cm long, reaching full size in about three years. Its heavy and often eroded shell bears strong radial ribs running perpendicular to curved irregular growth lines; both are visible in this image. The periostracum is bluish-black; the interior of the shell is bluish-grey, often with iridescent patches and margins. The meat of the mussel is bright orange. The California mussel is found in the intertidal and subtidal to a depth of 100 m. It commonly forms extensive beds on exposed rocky shorelines. The reported range for this species is northern Alaska to northern Mexico. 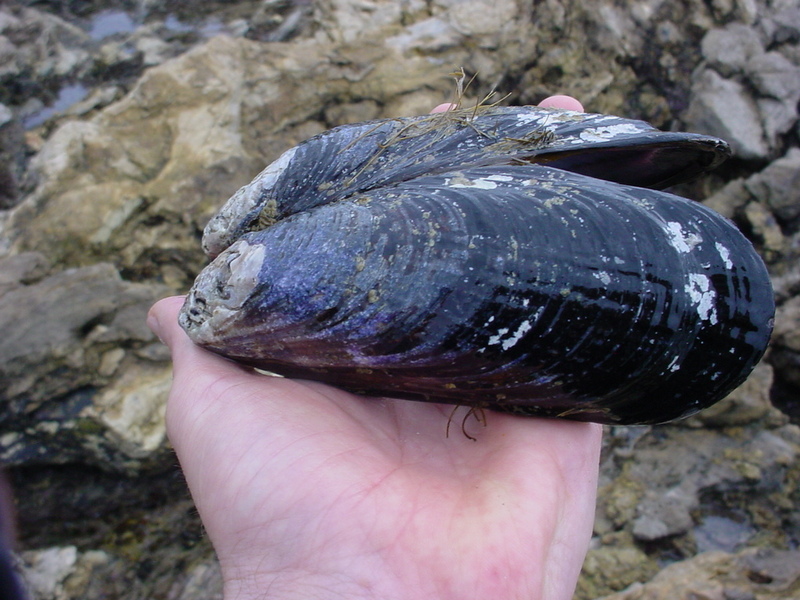 The Pacific blue mussel (Mytilus trossulus, potentially M. edulis as well) is also commonly found along the Central Coast. It can be differentiated by its curved ventral margins which the California mussel lacks. 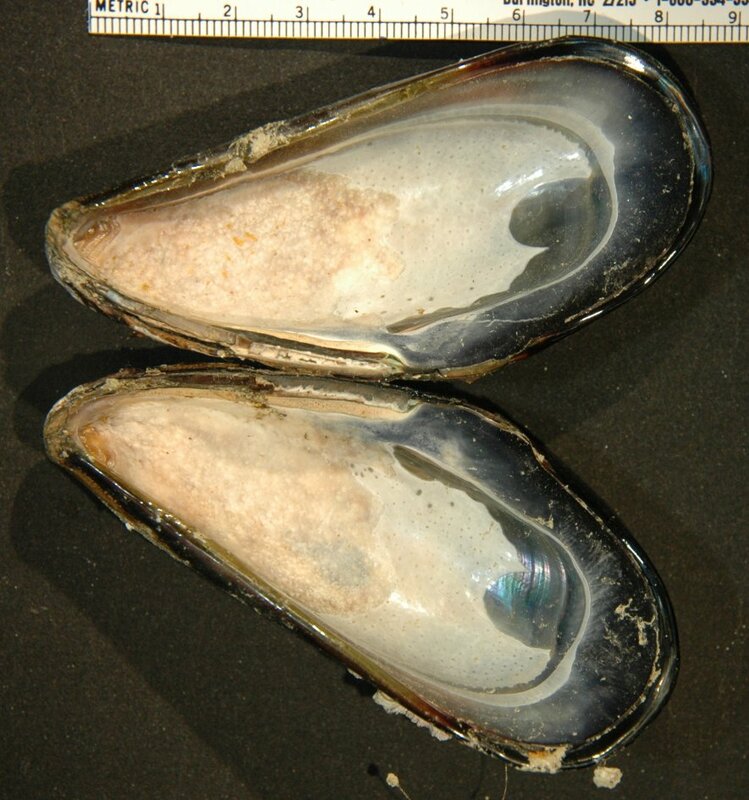 The Pacific blue mussel also has a smoother shell, as it lacks the California mussel's strong radial ribs cross-hatching the shell's irregular growth lines. 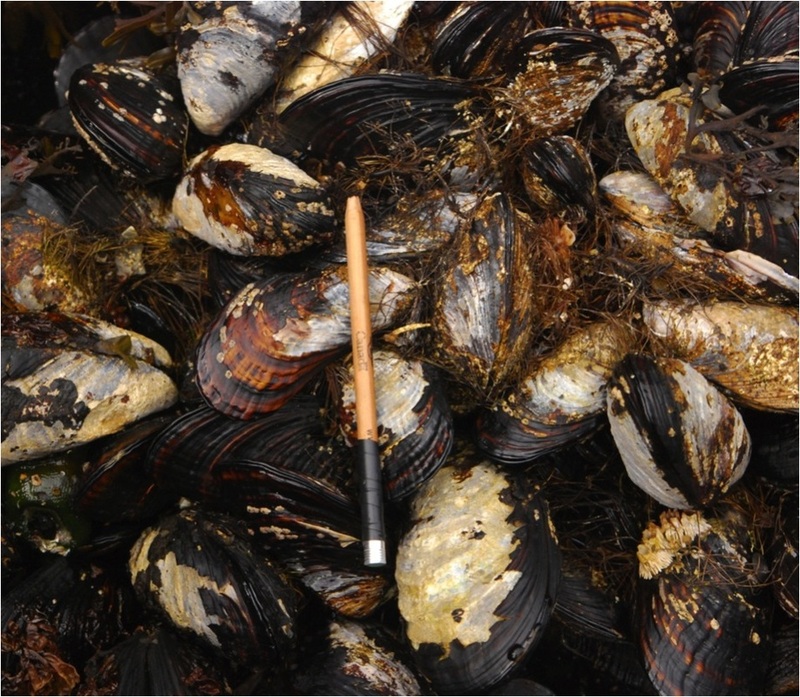 The California mussel reaches larger sizes and is more elongated than the Pacific blue mussel. 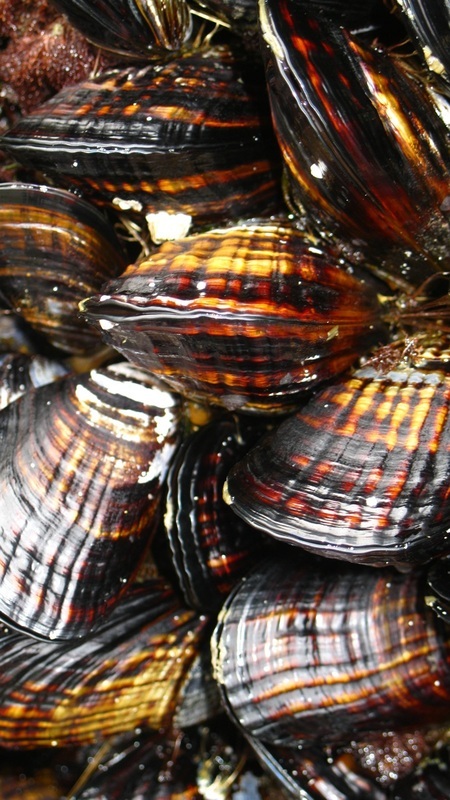 California mussels have been investigated as a possible species for aquaculture: study by Yamanda and Dunham (1989) found that California mussels grew faster than blue mussels (the most common aquaculture mussel) during the half-year study period, indicating that farmed California mussels might be profitable. However the Canadian Department of Fisheries and Oceans has reported that the lack of appropriate mussel seed has hindered the development of this industry. Coastal First Nations traditionally used the shell of this species to make tools, as well as the meat for food. 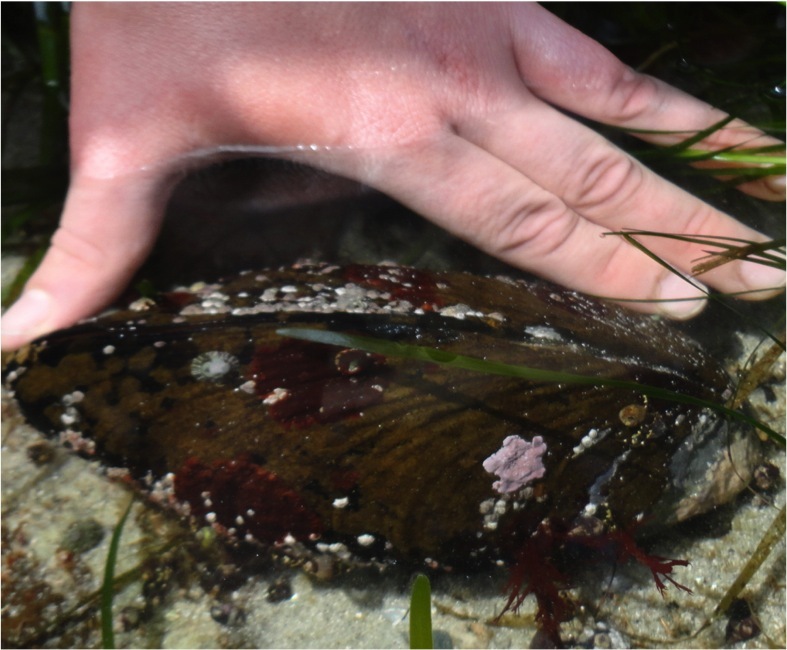 Mussels secrete tough byssus threads to attach themselves to rocks - this makes them very difficult to remove. They often play host to pea crabs, and may even contain tiny pearls. Studies have found the California mussel to be very sensitive to the relatively low levels of caffeine pollution found in the Pacific Ocean. Rey, Granek, and Buckley (2011) tested the effects of caffeine exposure on the growth of stress tissues, and found that mussels exposed to similar caffeine levels to those found in the Pacific were more likely to have greater build up of stress tissues. Cowles, D. (2005). Mytilus californianus (Conrad, 1837). Invertebrates of the Salish Sea. Rosario Beach Marine Laboratory. Accessed 18/07/2014. Lamb, A., & Hanby, B. (2005). Marine Life of the Pacific Northwest. Madeira: Harbour Publishing. P. 185. Arden Mathieson, Kelly Fretwell, and Brian Starzomski (2014).